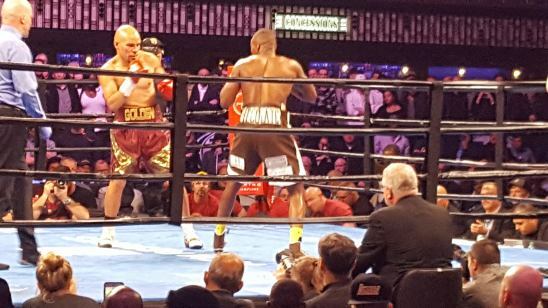 Caleb Truax didn’t start quite as fast and sharply as he obviously would have liked to Saturday night at the Minneapolis Armory and Peter Quillin had the edge after the first round in their IBF super middleweight title eliminator. But an accidental clash of head rendered a no contest as Truax was cut to the bone on the inner corner of his right eye. Caleb Truax squaring off in the first round against Peter Quillin in their IBF super middleweight title eliminator. In post fight interviews the doctor explained how serious the cut is, Truax’s corner said they believe the right decision was made, and Truax said he wished he could have continued but knows the doctor makes these decisions. Quillin said he hopes the two will fight again but that for now it is most important to recognize the necessity of safety and look for that fight in the future. The two combatants obviously respect each other a great deal and they would like to fight, so they and the fans will have to wait to see if that can happen. Look for a full report from Boxers and Writers Magazine in the coming week.